Ford Ecosport and Renault Duster have been competing with each other since the time it has been launched in Brazilian market and Renault Duster was on leads for last few months but by just marginal units. The sales of january 2013 are out now and Ford EcoSport sold almost double the times the Renault Duster and seems like Renault Duster is feeling the pinch of heat of its launch in India too. By clocking 6,367 units, Ford EcoSport sits at the top of the passenger SUV segment in Brazil while its main rival Renault Duster could manage only a distant second at 3,695 units. This will continue to compete with Renault's Duster while it launched in March 2013. Ford's EcoSport were recently spotted at a delaer in Delhi - watch out exclusive Imager here. 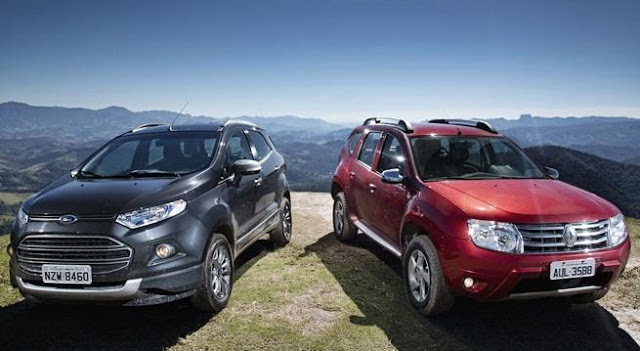 Read the comparison between Renault Duster and Ford EcoSport here.